"Rediscovered" by nurseryman Yijia Wang, who took these photos, in the Chinese province of Medog near the Tibetan border. L. medogense grows at about 10,000 feet (3000 meters). When asked about the patch of snow in the background, Yijia responded the photo was taken on June, 26, his birthday, and that the snow is on the mountain side face to the south and that it is usually melted in June - August and starts snowing again in September. This makes for a very short growing season for L. medogense. 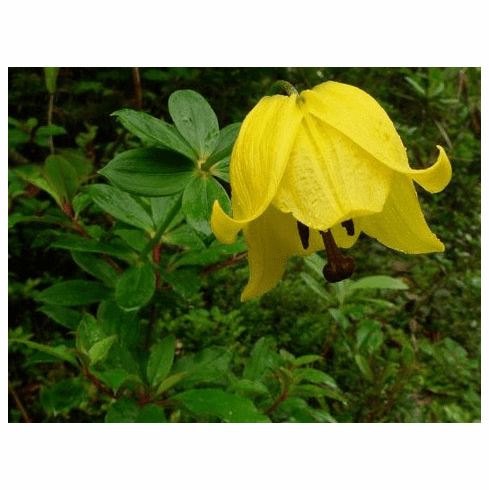 Yijia also expressed concern that the lily he found possibly was not L. medogense for the reason the original 1985 discovery description said that the scales of the bulb were "purple-red" in color. This bulb upon careful inspection so as not to disturb it, had white scales. Everything else from the original discovery description by S. Yun Liang matches Yijia's lily to perfection, including the whorled leaves which are found in only one other Chinese native. The only question is the color of the bulb. Many lilies are highly photo-sensitive and turn pink to purple in short order when exposed to any UV light which might account for the color difference. A return trip by botanists would be in order for this lily. Title photo copyright Yijia Wang, all rights reserved. Photo inserts 1-4 also copyright Yijia Wang, all rights reserved. Used with permission. Photo insert #1 shows the precarious position this where lily chose to grow. Photo insert #2 shows same stem up closer with its surrounding shrubs and ground cover. Photo insert #3 is of a taller stem, again in natural habitat. Photo insert #4 closeup shows as described "Tepals yellow, unspotted, dark purple at base adaxially, ellipticas" as described for the original discovery in 1995. Yijia Wang offers seed of several Chinese Alpines at his nursery at www.canursery.com though as of this writing in January of 2019, no seed was being offered of this particular species from the 2018 growing year.